Sydney Theatre Company (STC) presents, CYRANO DE BERGERAC, by Edmond Rostand. Adapted by Andrew Upton. Translated by Marion Potts. At the Sydney Theatre, Hickson Rd. Walsh Bay, 11 Nov - 20 Dec, 2014. This production of Edmond Rostand's famous, CYRANO DE BERGERAC, has been adapted, a second time by Andrew Upton, who also happens to be the Director of this production, (the first adaptation being from a translation from the French, by Marion Potts), assisted according to the program notes, by Kip Williams. Both, recently, collaborated on CHILDREN OF THE SUN, Maxim Gorky's play. This version of 'CYRANO' is stripped down. Horribly stripped down. HORROR: disgust; great dismay; bad or mischievous. True to Edmond Rostand's original, Andrew's (Upton) earlier version tended to resolve each event or conflict before moving on to the next. This neatly episodic style has been largely unpicked over the past month, and we now often find a character entering to progress the narrative whilst we are still at the height of the previous event's climax. The result is a suspension of resolution that propels us further forward into the story. A Performance (theatre, back-stage) at the Hotel de Bourgogne. The Bakery of the Poets. A Square in the Old Marais. The Post occupied by the Company of Carbon De Castel-Jaloux at the Siege of Arras. The Park of the Convent of the Ladies of the Cross, Paris. in the original Rostand text is, of course, one of the celebrated achievements of the play. To remove them, to cross-fade, to telescope, to simplify them is, perhaps, equivalent to chipping off the 'private parts' of the Michelangelo sculpture of David - a contemporary defacement?! Mr Williams states: "We also identified a pattern of characters declaiming their state of mind. We have asked ourselves, "What can be communicated without being stated?". So, to do just that, let's remove most of the text from the secondary characters, for example, among many others: Ragueneau, Duenna, Christian, Le Bret, De Quiche. And what does one have left, relatively, on the stage, then? Why, 'cardboard thin cut-outs' of characters in costume, instead of the detailed human characters that are part of the celebrated 'colour' of the writing of this famous poem-play by Rostand - 'real' lives in 'real' worlds in each of the acts. All that is left, in this new adaptation, are shallow narrative functionaries, who have no 'minds', at all, to 'declaim' - no character, either then, just a spare function to facilitate the narrative. Pity the actors who having accepted these famous roles written by Rostand, finding themselves instead with disemboweled pencil-thin caricatures, from Mr Upton and Williams. What with the cuts to the famous Nose speech of Cyrano in act one and the removal, entirely, of the equally famous Moon speeches in act three (with de Quiche), revealing the humour and wit complexity of Cyrano, and bye-the way, the celebrated poetry of the play, it seemed to me to be a further confirmation of a sense of the desecration of a highly regarded masterpiece. That this is the third production of CYRANO DE BERGERAC at the STC, one would have thought it was still regarded highly by the present company leaders, for it to be staged again, yes? So, if it's not 'broken' why fix it? And if is 'broken' what justification can we have to do it three times? I've got a list of classics, I would love to see, that have never been done. Mr Williams: "In the same vein, we have sought to streamline the plot - pruning subplots, whilst allowing narrative information to unfold at a quicker rate. Consequently, the CYRANO we have fashioned over the past month has a quicker rhythm and drive." Mr Williams, again: "And, finally, we have reconfigured the structure of the fifth act to allow Cyrano and Roxane to be alone on stage for the final moment of the play." That the death of Cyrano is merely an intimate and personal moment reduced to just those two is, of course, a necessary action for these adaptors/directors, considering that the other characters - in this instance, in the original, Ragueneau and Le Bret - have been so reduced elsewhere in the text to mere functionaries, that their responses in the celebrated death scene of the fifth act, written by Edmond Rostand, to magnify the emotional impact of Cyrano's end - had to be an absolute imperative, a necessary expediency and expungement. To have them witness to the death of Cyrano, in this adaption, would have not made dramaturgical sense or pertinent presences. That Mr Upton and Williams had also trimmed the writing for the Sisters Marguerite and Marthe (more edits to Ms Zemiro's promised 'job'), in the beginning of the act, demonstrates further the emotional inhibitions (constipation?) of these two artists. These are, I believe, disgraceful cuts to this famed Romantic drama. That the major theatre company in Sydney, the STC, felt that they were necessary has me questioning this company's responsibility to the writer of the play that they chose to revive. To revive a Classic, and favourite Masterpiece, and then destroy the appreciated reasons for its classicism and mastery, and popularity, is delinquent. (Children of the Sun, again!) The celebrated achievements of CYRANO DE BERGERAC by Edmond Rostand, as Dramatic literature, have been destroyed for the audiences attending this production. Add: If the leading company cannot afford the celebrated design demands of the five different acts, made by Rostand. If the company cannot afford all the costumes of the characters in the play (e.g. Roxane's mourning clothes in Act Five - a white dress (from Act Four, some few years before (white on a battle field?) - YES, in this Design, white for safety in a war zone and later, mourning.) If the company cannot afford the hiring of the number of actors required to reveal the glory of this play (e.g. there was no disguising that Bruce Spence (and some of the others) was a most incongruous nun in the fifth act procession - it had to be a Monty Python costume gesture/joke, surely? What, an Aussie, piss-take, larrikin joke, wasn't it?) I reckon, if these 'ifs' cannot be achieved, DON'T DO IT. The Set Design (Alice Babidge) was dire in its paucity of achievement - a 'genius' solution, however, in its obvious budget restraints. The STC on this large Sydney Theatre stage - remember the Design solutions to their PYGMALION? A virtual empty stage - do not seem to have the budgets to fulfil the demands of the playwright, or, they have very perverted ideas about what is acceptable contemporary envisioning. I can tell you the audience was not happy with the PYGMALION look. Nor, with this look, whatever the critics say. It was not, did not look like, contemporary theatre visual innovation to me, just paltry budgeting. After all, this is the third production of this play presented by the STC, in living memory. (And we had been given another, highly lauded production by Sport For Jove, earlier in the year.) 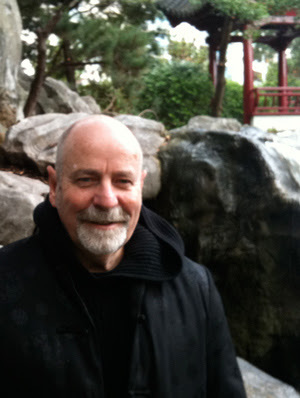 And, having seen all three from the STC, one can only say that there has been a disrespectful disintegration of theatrical integrity by this company in their production and artistic achievements and responsibility to the writer, Rostand, and to the audience of this play with this production. I smiled internally, recently, when a critic talked of the 'faithful' adaptations and/or directorial achievements of Mr Upton, when talking of a recent production at the STC. (Was it CHILDREN OF THE SUN, or ENDGAME?) Where is Richard Wherrett's ghost, and why is it not haunting this tawdry effort by Mr Upton and Williams? Or were there some ghostly remnants of his Costume Designer's clothes on that stage, mocking us with memories of what are now 'old times'? It seems, Golden Times. Indeed. Richard Roxbrugh won Best Actor for his work as Cyrano De Bergerac, from the Sydney Critics, in early 2015. 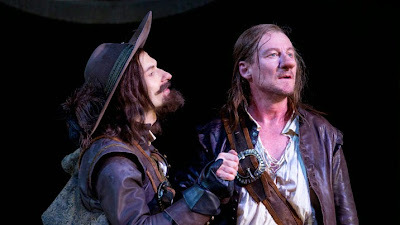 I did think it was a cruel joke, to have the featured photograph accompanying the review of this production in the Sydney Morning Herald (see above): that of Mr Roxburgh, as Cyrano, beside Yalin Ozucelik, as Le Bret, Cyrano's best friend. Mr Ozucelik had won Best Actor in an Independent Theatre Production (Sport For Jove) for his performance as Cyrano, in the year before, 2013. According to most who saw both productions, the performances were not in the same sphere of Best. I cannot fathom why Mr Roxburgh was awarded it considering some of the qualities of the other nominees and their performances (I noticed this production was not nominated in any other of the categories). Having major and famous speeches removed from his task, whatever the reason, does not help Mr Roxburgh's case, in my estimation. He began well, excitingly so, but then appeared to tire in act three and did not really recover, to be, finally, indulgently incoherent in the famous death scene of act five - emotional twaddle overriding the poetry of the writing. "What was he saying?" Text, in my appreciation of good theatre acting, should be the primary focus, not demonstrations of emotional states. Now, despite all this unhappiness with the decisions of this production and my consequent seething with depression during most of the performance, I have to confess I did drop a tear or two at its end. This was proof of the greatness of the story of this play. Even the pencil thin storyline, relatively left in this adaption, can be moving. (Has the STC alerted the Disney company as to the cuts it could adapt for them?) How awash, I would, could have been if I had seen a decent production of the play as written? How awash might I have been if the translation/adaptation had had some integrity other than, perhaps, an economic requirement for 'quickness', 'speed'. Maybe, my tears came from a recall of the STC production that Richard Wherrett had made, and was moved anew? Maybe, it was the memory of John Bell as Cyrano, and so, was moved? Maybe it was the memory of Helen Morse as Roxane, all wreathed in black mourning, with the delicate dropping of the autumnal leaves about her and, so, was moved? Maybe, it was the tragic flaws and beauty of Andrew McFarland's Christian, that I remember, and was moved? Or the wicked comedy and wit, pathos of Peter Whitford as Ragueneau? Or was I moved to tears by the present work of the STC's Artistic Director and his assistant, moved to tears from some other urging? Grief? Anger? Pity? Despair? Rostand's masterpiece, Cyrano de Bergerac, is subtitled a "Heroic Comedy", and the combination of the adjective and the noun is descriptive not only of this play but of its authors unique power in the theatre. To compose romantic drama successfully in the machine age requires unusual endowment and considerable tact. Rostand was able to blend romantic action and lyricism with humour, and the result was a brief renewal of romanticism on the European continent. Mr Upton has not achieved any of this, on this continent-island of Australia, either in this adaptation, or in his lazy direction of Edmond Rostand's famous play.